That brief disappointment aside, this VSI is most illuminating. The Introduction made me realise that I have a limited view of what French Lit is. I thought of it as novels and poetry coming from the geographical borders of France, with a proud history of 19th century authors like Zola, Balzac, Maupassant and Victor Hugo, plus an impressive bunch of Nobel Laureates. (There are 17 of them, starting with Sully Prudhomme who won the first Nobel in 1901, and including Anatole France, Albert Camus, André Gide, Albert Camus, John-Paul Sartre (who knocked it back), J.M.G. Le Clézio and Patrick Modiano.) But of course the borders of France have not always been where they are now, the French language has not always been the language spoken now, and authors have not always written in French. And thinking of Balzac, Zola, Hugo and yes, Maupassant, I can see that it is certainly true that French protagonists are often isolated from or in opposition to their society, mostly to be critical of it, but sometimes to express emotional turmoil. 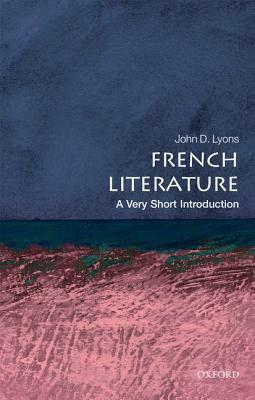 Like protagonists from other cultures, French protagonists always have some sort of problem, but for them, their place in society is at stake, which, Lyons says, means that the text reveals a lot about that society at the time. Moving on to Chapter One, ‘Saints, werewolves, knights and a poète maudit: allegiance and character in the Middle Ages’ we find that in this feudal era when power was exercised through shifting alliances between leading families, it was the Church that was a unifier, providing a kind of meta-identity delineating the southern and eastern boundaries of Europe. Literature of this period explored loyalty, mostly in verse form. Lyons tells us that The Life of Saint Alexis (c.1050) explores the problem of loyalty to God or to family, while the Lais of Marie de France (c. 1160-80) feature unhappily married women and Bisclavet explores the difficulty of being loyal to a husband who is a werewolf. (It’s not as silly as it sounds if you think about how some men are transformed into monsters when they inflict violence on their wives). [Like English literature of the period], French medieval literature includes epics about knights, exploring not only loyalty but also the usefulness of the knight to his lord. There are two genres: the chanson de geste and the roman (a romance). Of the former, the 12th century Song of Roland (La chanson de Roland) focuses on the knight’s prowess and his loyalty to the sovereign and his responsibility for countless deaths because of his unreasonable pride in refusing to call for help. In the roman Erec and Enide by Chrétien de Troyes, (c. 1170) the protagonist has to find the right balance between love for a woman and military success. I am rather charmed by Lyon’s description of this story and intend to seek it out. Maybe Gutenberg has it.. The lyric ‘I’ signifies a shift in narration, very early in French Lit, from a narrator telling (or singing) the story of the protagonist, to the protagonist himself as narrator, as in the Romance of the Rose (Roman de la Rose) written by two poets: Jean de Lorris towards 1230, and Jean de Meung towards 1275. This shift in narration allows for the depiction of a ‘battle for the soul’ by an everyman experiencing the suffering and perplexities of love, and it allows for the emergence of the poète maudit (‘the accursed poet’), subject to endless bad luck and usually a criminal. This reminded me straight away of the unlucky protagonist in Pierre Lemaitre’s The Great Swindle (see my review), marginalised by French society after WW1 and forced into a life of crime. So although Maupassant doesn’t get a mention, already I have deduced from this superb little book that Maupassant was, in his novel Like Death (Fort comme la mort) writing in a tradition that dates back to medieval times. 132 pages on French Lit! I own thousands on the much smaller subject of Aust Lit, but I guess I can see how you might (re-)expand those 132 pp out to two or more posts. My favourite French character is Maigret (yes I know, I’m a peasant) and he very much knows and understands ‘his place in society’. On the other hand my favourite author is Sartre, and I guess his characters don’t. Ah, but isn’t Maigret a detective? And aren’t they always ‘outside’ their society in a way? I’m thinking of The Bill and other TV shows like it where the detective is always separate from the policeman on the beat by virtue of his superior intelligence and skills, and also of other TV shows where the police in general are never shown as part of the community, but trying to bring order to a disordered world. I haven’t read Maigret, but Donna Leon’s stories set in Venice are like that too, a world-weary cop hopelessly trying to solve crime in a world full of corruption and stupidity. Maigret lives in the heart of Paris and walks to work. His home life, and his life as a Parisian, are integral to the stories, as is his ability to ‘be inside’ the events he is investigating. I am tentatively planning to review a Maigret when I’m in Paris next year, might even persuade you and Sue to read one. Ok, you’re on! I’ll have a look at the library…. Alas, Fort comme la mort isn’t mentioned, that was my interpretation. I’d better edit what I’ve written to make that clearer! This might come in handy for you sometime – there’s a site in France similar to our PG. If you want to check there sometime and don’t come across it in a search, let me know and I’ll look for the link. It might be at the French Lit group or, failing that, I can ask Horvallis in the group. Thanks so much for this: I found the passage I was looking for (interestingly, the chapters are different). In the original Maupassant says that they can see ‘the mice’ which appears to be a French colloquialism for ‘children’. I think I would have translated as ‘the little ones’ rather than ‘kids’, which sticks out as an Americanism in a very French novel. I totally agree with you about the use of colloquialism (and slang). It’s so jarring to suddenly run into it. Yes, it’s like spelling mistakes – they jump out and ruin the atmosphere of reading. Yep, if I have 16 pages to cover the 19th century, Maupassant becomes a footnote to Flaubert. Hugo, Baudelaire, Flaubert – and I’m out of room. Yes, it’s fair enough, and it’s the limitation of the series. But what I like is that the way this book is written enables me to draw my own conclusions about authors who don’t get a mention. Once upon a time, in a different century, I was a French major in college. It’s been a long time since I have read much French lit, though. This book sounds like a great resource! *chuckle* I love that expression ‘in a different century’! If I ever go back to university (which I have promised myself never to do) I think I’ll do French language and literature, preferably with a sabbatical in France. Go for it! I spent two years in France (back in that other century). It is a beautiful place! Don’t tempt me… I have spent too much of my life in study already! Hi Vishy, yes, there’s a whole literary culture that I knew very little about, just scraps here and there, and this VSI is pulling the patterns together for me. Why did you choose to read such a short book on the subject? I would have thought an author would need at least 500 pages to do a decent job. Ah, Maupassant. I realised the other day that I haven’t read any since March, and I have my second volume of 88 stories to read! I hear you, and of course a longer book would be more comprehensive. But I am not a scholar, just someone interested in world literatures. I also have a VSI about Russian Lit and German Lit, also Spanish, Chinese and Italian. I’d like one about Arab Lit if they have one. (I don’t need one about English Lit because that was my major at university). Because I realise I’ll never read all the books I would like to I occasionally read books of summaries but then it just makes me want to read them in full. I think Vishy reviewed a slightly longer book on French Lit (One Hundred Great French Books: From the Middle Ages to the Present) which appeals to me. I will chase up Vishy’s review, thanks for letting me know about it. (I think I’ve missed some of his posts when I was overseas). VIshy sent me the link to his review, I’ve added it as an update to my second post about this book. My children had to read Chrétien de Troyes in school. Villon is still read as well but not as much as when my parents were in school. The others medieval authors are mostly read by literature students, I’m afraid. Honestly, I don’t understand why Maupassant isn’t in the book. He’s a major writer for the 19thC. I’m off to read part II now. He literally has 16 pages to cover the 19th century. Neither Verlaine nor Rimbaud are in the book. It is a tight squeeze. (The table of contents and index are visible via Amazon). Well, I can tell you now (because I’m now up to p88) that even Zola and Balzac don’t get much of a mention either, certainly not to the degree of detail that some other texts get. But I’m not complaining, I’m reading it to learn more about the patterns of French Lit, not for more about authors and texts I already know. The For Dummies series has a nearly 800-page volume on French Literature (in French). I browse through it at random rather than cover-to-cover reading and it’s been quite fun to own that. Ah, that sounds interesting, I might see if I can track that down. Thanks! Definitely tempting (although I have far too many books to read as it is…). Well, that is the charm of these VSIs. You can read the whole thing over breakfast.